The new Christmas designs which Meg launched on Hochanda Craft TV in September are now generally available. They include some fantastic new Christmas cards, including Christmas on the Farm and Christmas Plate - Home by Dawn, as well as a new selection pack of 3 cottage themed cards called Cottage Selection, shown right. 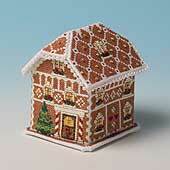 This pack includes a new small Christmas card called Fir Tree Cottage which is also available separately. In addition, the very popular Gilding the Gingerbread house has now been joined by a Gingerbread Chapel, a Gingerbread Lodge and a Gingerbread Tree so you can collect a gingerbread village! Finally, we've two very stylish additions to our keepsake range called the Snowdrop Box and Snowdrop Tray. The box is our first hexagonal design and would make a wonderful container for a small gift, or as a ring box on a dressing table. The snowdrop theme makes it an ideal project for the New Year. We now have available the new designs which Meg launched on Hochanda Craft Television in April. 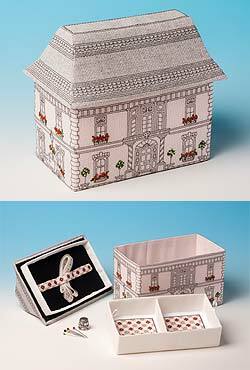 They include Victorian Mansion Sewing Box box (shown right). The roof lifts off to reveal a removable tray, with another section beneath. The bases of the tray and the box are worked to resemble Victorian tiled floors and a strap inside the roof will hold silks or tools. Other new designs are two new Paper Town cottages, Delphinium Cottage and Primrose Cottage; a Paper Box Bluebell Box, and Wedding Belles, a bridal shop fridge magnet. We now have available the new designs which Meg launched on Hochanda Craft Television at the start of December. They include Penguin Hall box (shown right), complete with penguins decking their hall ready for Christmas, a Christmas Candles gift bag to match the Christmas Candles card, and a new fridge magnet, the Blue Willow House. There are four new cards, the Castle, the Country Cottage, the Windmill and the Church. 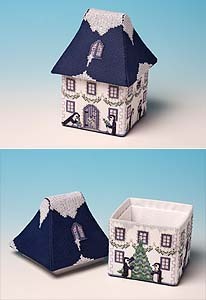 There's also a new range, Paper Town, stitched on perforated paper. The range includes Rose Tree House, Woodland Cottage and Tartan Cottage.